I'll always be your little girl. You'll always be my hero. My father died in 2003. In one stroke (medical and philosophical), I lost my career-counselor, life coach, and rock. The grief I have is ever-present and no doubt contributed to my illness, but the joy I have of being his daughter is equally abundant. In honor of the man whose guiding hand is forever on my shoulder, I want to share 10 things Louie B. Gregg taught me about life. On days like today it's important for us fatherless daughters, parentless parents, and adult orphans to remember the ones we lost and miss. If you're part of these distinct groups, don't be afraid to celebrate the dads that aren't here anymore to give a hug to, send a card to, or share a meal at the chinese restaurant using a coupon. 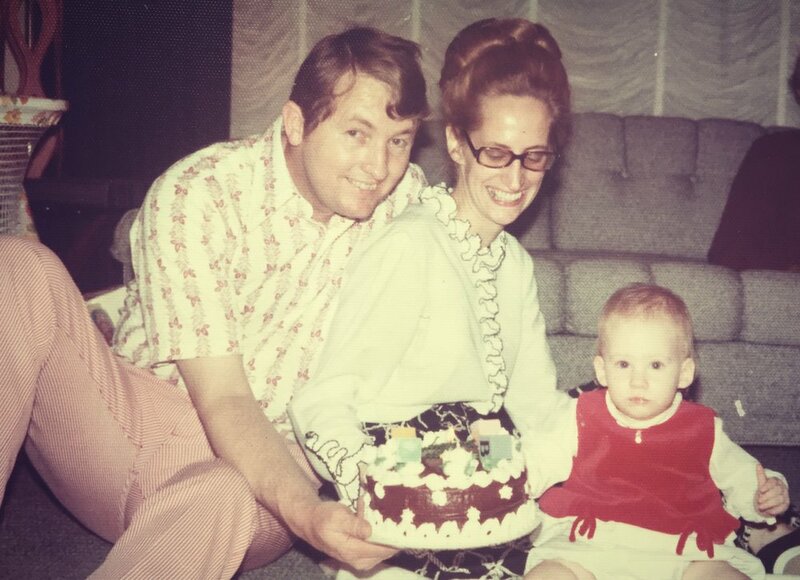 When my mom died in 1984, my dad became my everything. "Me, Dad and a cat" I would say countless times when people asked about my family. He was my fa-mother, my shoulder to cry on, my stiff upper lip, my teacher, my advisor and everything else in between. He did it all gracefully and taught me that you just deal with what life hands you. You just do. As early as 5, Dad was asking me what I wanted be when I grew up. He didn't care what it was - okay maybe when I decided to be a dancer at 17 he panicked - but overall he just wanted me to make sure I did what I loved. He knew if you wake up every morning loving your profession it makes for a better life. He knew success and money follow those who are happy and passionate about their work. And he was right. I hear a lot of stories about motherless daughters who had to step into their mother's role. Dad didn't buy that. He knew I would grow up faster than I needed to, so he tried his best to let me just be a kid. He took on as many of the "motherly duties" as humanly possible so he didn't have to burdened me with trying to be a 12 year old adult. My dad loved life. Traveling, gambling, race car driving, dining, dancing. His laugh was loud and true. He knew we all need to pay the bills, but if we work hard we can make enough money to have extra to enjoy life more. Hence, why I got a job the day I turned 16, never stopped and still take multiple vacations a year and spend most of our extra income on family fun time. I learned me-time from my dad before it was cool. Despite raising me, running a business, and leading civic groups, Dad always played racquetball, had lunch with friends, and played poker consistently every week. These were the things that kept him charged. He never felt guilty about it because he understood relaxing was how he could stay sane. Yes he played hard, but always with a coupon book in hand and never at full retail. The owner of his favorite local Chinese restaurant once said, "Mr. Gregg you're a successful business man. Why do you always use a coupon?" Discount Dad said, "how do you think I became a successful businessman?" Boom. Drop mic. We visited my grandmother every year in Florida. Sure we went to Disneyworld and touristy stuff, but every visit involved a "honey-do list." My super awesome grandma, would say, "honey, can you: fix the garage door; change the lightbulbs; unclog the guest bath." She built the list between our visits and whatever she needed done, we helped to do. Not surprising I have a cadre of friends who help me cook and clean up when they're at my house and vice-versa when I'm at theirs. Everyone can use a helping hand. Make yourself useful whenever you can. Can you imagine trying to raise a highly-sensitive teenage girl whose mom just died? Yeah, me neither. I was a hurricane. Angry, frustrated, embarrassed, vicious, insecure, resentful. Dad rarely raised his voice to me. He had a preternatural gift to just flow with my turbulant emotions. Lessons that have proven vital now that I have a highly-sensitive pre-teen son. I pray I have grown to be my own bamboo tree as I enter this upcoming teenage hurricane. My dad had no idea what he was doing with a teenage daughter. I would have been a handful if my mom had lived, but alone Dad was way over his skis. So he built a village of women elders to help him out: his mother, his sister, his sister-in-laws, my mom's best friend. He reached out when he needed guidance in uncharted territory. We don't have to go it alone people, find your tribe and ask for help when you get stuck. Elevators, grocery check out lines, airports - there was no destination that my dad didn't start a conversation with a stranger. It used to embarrass me, but in today's devisive world what a beautiful, shiny example of how we should all be toward one another. Imagine if we were interested and kind to each other rather than guarded and protective? Everyone has a story, so we should all go Gregg and treat strangers with curiosity, kindness and empathy. A big hug to everyone whose missing their dad today. Please share any lessons your dad taught you in the comments.